our most popular line of cat doors! Designed to be mounted on a standard exterior residential home door, PlexiDor door-mounted cat doors are professionally engineered and manufactured in the U.S.A. from quality materials for the optimal comfort and safety of your cat - and of course, to be long-lasting! They provide convenient access to and from your home for your pet with a high level of safety and security for your home. All PlexiDor door mounted cat doors come complete with interior pet door frame, exterior door frame, door panels, steel security plate, and stainless steel hardware, and are backed by PlexiDor's industry leading 90-day satisfaction guarantee and 5-year no-hassle warranty! 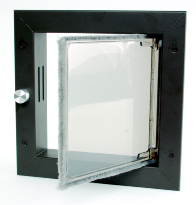 All the premium features you expect in a quality cat door - industry leading draft-proofing and energy efficiency, sturdy aluminum frame, concealed hinges, thermo-pane acrylic panels, and unsurpassed 10-year warranty. Available in 3 colors to suit every home and cat! Secure - Doors have locks, plus separate security plates, and can only be unscrewed and removed from inside your home. See-Thru Panels - Rigid, high-impact, shatter-resistant composite acrylic panels. Two-Way Self-Closing - Panels close automatically when pet has gone through. Mechanism concealed within main frame. Safe and Easy to Use - See-thru composite acrylic panels open smoothly both ways with a gentle push. Close Quietly - Won't disturb you, or frighten your cat. Energy Efficient - The panels are molded to form a "Thermopane" effect for excellent insulation, and edged with snug-fitting, high-density, nylon pile weatherseal to provide superior draft-proofing. Ideal for extreme climates. Heavy-Duty Frames - Anodized aluminum won't rust, crack or warp. Attractive satin finish, baked on white or brown powder-coated finish. If you find a lower advertised price anywhere, we'll beat it! Just call us toll free at 1-877-374-2695 to order. includes interior pet door frame, exterior pet door frame, door panels, steel security plate, and stainless steel hardware. Copyright 2003-2019 Northland Pet Supply Inc. All Rights Reserved.